Hanoi (VNS/VNA) - With its advantages fully recognised, the southern “emerald island” of Phu Quoc off of Kien Giang province is set to live up to its title of a special administrative-economic zone. Many investors are flocking towards the “promised land,” especially since early 2014 when the island was connected to the national electrical grid via submarine cables. On the sides of the main road from the coastal Duong Dong town – lying at the midsection of the island – to the southern tip, several hotels, restaurants, apartment complexes and resorts are under construction – the majority of these projects owned by big-name corporations, domestic and foreign. Similarly, to the north, tourist and entertainment complexes with scales ranging from vast to medium-sized have popped up in recent months. “Among these projects, 26 are foreign direct investment (FDI) with total capital set to reach 290 million USD,” Nhat told the Tien Phong (Vanguard) newspaper. Aside from the private sector projects, several large-scale public projects are being carried out throughout the island to meet the demands of an economy growing at 25-30 percent a year, said Huynh Quang Hung, Vice Chairman of Phu Quoc People’s Committee. Most notable projects are the Phu Quoc international airport (phase 2) with total investment of 3 trillion VND (132 million USD); the 51.5km long north-south axis road – with investment of 2.5 trillion VND (110 million USD) – which has achieved 92 percent completion; and the 100km island-bound road, with investment of more than 3 trillion VND (68 percent of the workload has been finished). Other projects include upgrading the An Thoi fishing port, breakwater construction and dredging at the Duong Dong river’s outfall, as well as an international passenger port in Dong Duong. Together with the influx of investment, the stream of tourists to the island has also seen a dramatic increase, said Hung. 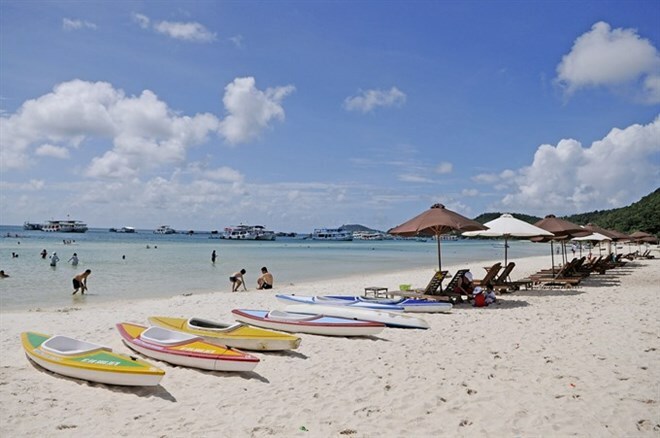 The number of tourists coming to Phu Quoc in 2016 rose 63 percent compared to 2015, and the first six months of 2017 saw a 44 percent increase compared to the same period in 2016, while the number of international tourists increased by 77 percent. The island is also receiving an influx of people from the mainland looking for job opportunities. Tran Van Phuong, 25, hailing from An Giang province, came here 2 years ago to work as an ironworker for the numerous construction projects underway on the island. “I can earn 300,000 VND (13.2 USD) for a day’s work, double the amount I get back in my hometown, in addition to free meals,” Phuong said. Despite higher living costs on the island than on the mainland, but offset by higher income, there is an increasing number of people from all over the country arriving here seeking jobs. A tremendous amount of energy is required to drive the booming development of the island. According to Nguyen Van Minh, head of Phu Quoc Electricity Company, the average year-on-year electricity production growth rate is over 103.48 percent. Electricity output has increased from 57.4 million kWh in 2013 to an estimated 297 million kWh in 2017. However, accompanying this bubbling growth are numerous “headaches” that the authorities need to address, especially in terms of environmental protection, said Huynh Quang Hung. Waste treatment facilities on the island are still lacking – the waste treatment plant is still being built, a plan for a wastewater treatment system remains on paper due to lack of funds. The stream of workers coming from other localities also pose an array of public order issues in certain areas. In addition, Hung said, the number of complaints and lawsuits concerning the land compensation rate is also on the rise. Hopes are high for a special zone unburdened by common constraints and enjoying privileges other localities can only dream of. To fully achieve its full potential and live up to its future status, Chairman of Kien Giang province People’s Committee, Pham Vu Hong, stressed the life-and-death need for a new policy mechanism for Phu Quoc as a special administrative-economic unit.